I’ve been working on my desk space for a while now, it was today I realised I quite liked it. I am pretty sure there’s a lot more to add, my obsession with adorning wall space has got a little out of hand lately. I’ve always loved cluttering up walls and having all my junk on display means I never forget where anything is. What a gorgeous little work space! Our desk needs to be far more organised but I'm in an endless fight with Transformer Toys. very cute space. I wish I was better at decorating my walls. I never know where to place things. Inspiring! I'm getting a new desk and space soon, i love how much you have displayed! Alice, it's a work of art! I bloody love it. It's really beautiful Alice, I'm so jealous. 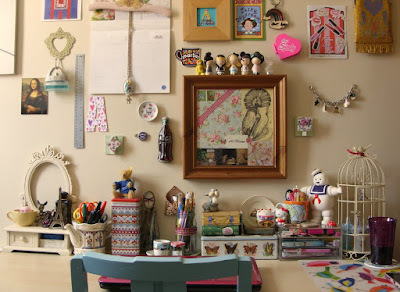 I dream of having a desk of my own again which I can decorate for inspiration. Love it. And I know it's weird to say thank you for a thank you letter - were would it end? - but I loved your note. This is so ace!!! There are so many things to look at and be inspired by (just the way a desk should be). And I love that you have a Mr Stay-puffed figurine??? It is a work of art Alice, so much nicer than minimalist spaces - it has character.